If your grey horse doesn’t gleam in the winter months or those white socks are never quite bright enough, we offer some top tips to win the battle against mud and stable stains this coming winter. Keeping on top of stable stains and mud might sound exhaustive, however, riders tell us that regularly tackling dirty tails and muddy coats ensures that when it does come to competition day, the work is halved. Turning that yellow tail into bright white is a lot easier if it is cleaned regularly. Spot clean throughout the winter when it’s too cold for a full bath. There seem to be plenty of suggestions out there as to what to use to get your grey horse white. From washing powder through to washing up liquid, we say be careful not to upset your horse’s delicate natural PH balance of his skin by using harsh products. Equine stain removers can help with difficult to budge stains; our associated professional grooms prefer to use horse products designed for the job and recommend that you always do a tiny patch test before using anything new on your horse’s skin. 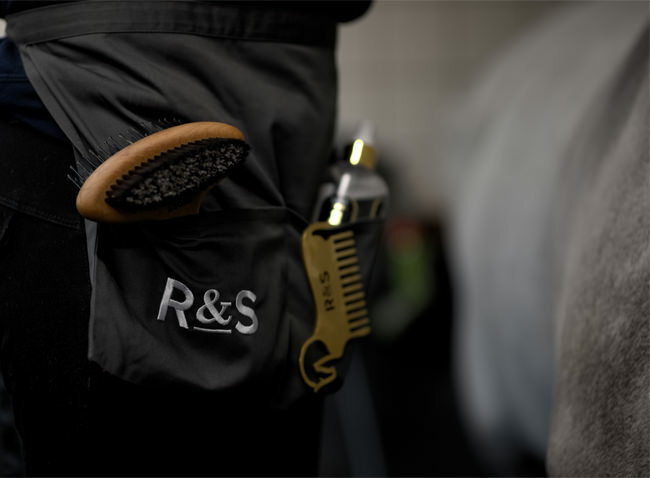 The Renwick & Sons Kit has been designed to tackle the worst that winter can throw at your horse, thanks to our unique bristle technology and ergonomic design. Bristle properties ranging from anti-static through to anti-bacterial self-cleansing ingredients, mean that our customers regularly receive comments on their horses’ healthy shiny coats, even those with grey horses. If you are using a standard grooming kit, then make sure you regularly clean the tools, so you are not merely working the dirt and bacteria back into the coat, and be sure to throw away brushes that have missing bristles. Using the right tools means less hard work your end, with better results. So, you’ve loaded your pristine grey horse onto the lorry. Arrive at the showground only to discover that he looks exactly as he did yesterday (straight out of the field/stable). Using a waterproof tail bag will help keep his tail clean and using travel boots (or wraps) which cover the hocks and coronets should catch most of the mess, leaving you the simple job of a quick wash off, rather than significant clean up when you arrive at the competition centre. White socks can be a challenge, but many traditional horsemen and women still use chalk on their horses’ legs. Using a chalk-based product, they mix with water and use stable bandages over the top. In the morning, they unwrap, brush off the excess to reveal white socks and stockings. Neck covers will help keep your horse’s neck reasonably clean, but many grey horse owners recommend using a Lycra hood worn under your rug. Choose a reputable brand and make sure it fits correctly so it can’t slip over your horses’ eyes during night use. Ultimately keeping your grey horse clean during the winter months does bring notable challenges and what works for one grey doesn’t always work for another, but we hope our tips and advice help your horse shine in the competition arena this coming winter.